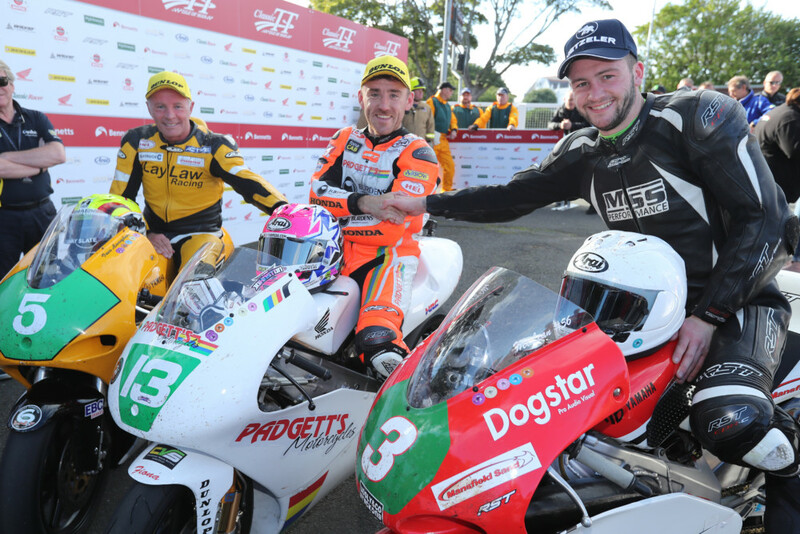 2018 Classic Lightweight TT Race Result—Lee Johnston paid tribute to Bruce Anstey after winning a thrilling Dunlop Lightweight Classic TT Race – the second race of the 2018 Classic TT presented by Bennetts – after a titanic battle with Adam McClean. The Northern Ireland rider replaced Anstey on the Padgetts Racing Honda on which the New Zealander won the corresponding race last year. Lee Johnston at St Ninians during the Dunlop Classic Lightweight TT race. Although Anstey was unable to defend his Dunlop Lightweight Classic TT title due to illness, the popular New Zealander did ride a demonstration lap on a Padgetts Racing RCV Honda ahead of the race to show that he was on the road to recovery. Dan Cooper on the Turner Racing Yamaha was first away from the start line at Glencrutchery road but almost immediately was reported as a retirement at Crosby Crossroads. Cooper was followed by Dean Harrison on the Laylaw Racing Yamaha, Adam McLean, who was the fastest qualifier with a time set on the opening night on the Binch Racing Yamaha and Ian Lougher, Harrison’s Laylaw Racing teammate. McLean was first to Glen Helen, less than a second ahead of Lougher with Lee Johnston, who started from his traditional grid position of 13, riding the Padgetts Racing Honda, completing the top three a further five seconds back. Harrison was less than a second behind Johnston with Sweeney holding fifth but already fifteen seconds behind the race leader. Top three in the Dunlop Classic Lightweight TT race, Ian Lougher (left), Lee Johnston (center) and Adam McLean. That remained the order at the end of the opening lap with McLean’s 116.329 giving him a four-second lead from Johnston (115.915) with Lougher (115.589) third a further three seconds back. Harrison 113.371 and Sweeney (112.461) completed the top five at the end of the opening lap. Johnston was on a charge and had cut McLean’s lead to less than a second at Glen Helen and had put ten seconds between him and Lougher in third with Harrison dropping back almost half a minute behind his teammate. Johnston moved ahead of McLean by Ballaugh and extended the lead to three seconds at Ramsey with Lougher holding third and Harrison and Sweeney completing the top five. Coming into the pits at the end of the second lap, Johnston’s 117.463 gave him a 1.7s lead but McLean (116.870) made up a couple of seconds with a faster pit stop and the gap was reported to be only a tenth of a second at Glen Helen on the third lap. Lougher experienced a lengthy pit stop which put him a minute behind the leaders but he was still eighteen seconds ahead of Harrison with Gary Vines moving into the top five after Sweeney ran out of fuel at Hillberry but Vines then retired in the pits leaving Joey Thompson on the John Chapman Racing Honda in fifth. Johnston upped the pace after Glen Helen and his third lap of 111.870 – including the pit stop – to McLean’s 111.181 gave him a lead of almost ten seconds from the Northern Ireland rider. The Laylaw Racing pair maintained their third and fourth places with Thompson holding fifth. 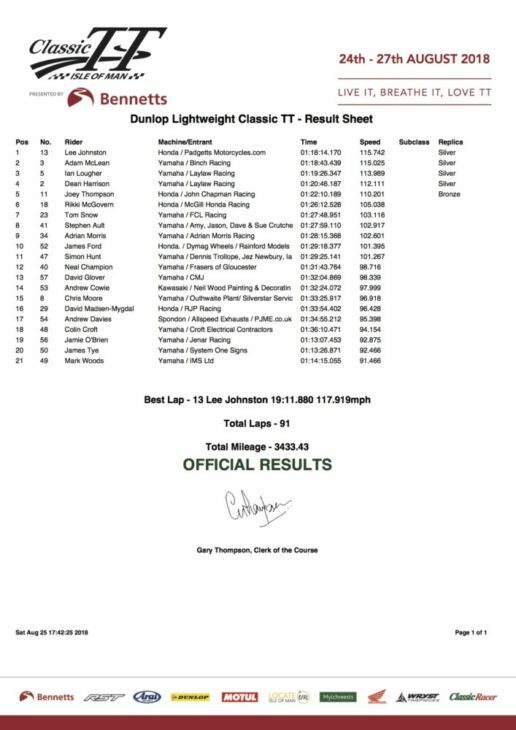 Johnston duly held on to take the chequered flag with a last lap of 117.919, finishing almost thirty seconds ahead of McLean (115.902) with Lougher’s last lap of 117.439 clinching the final podium place. Harrison was a minute and twenty seconds behind his teammate with Joey Thompson completing the top five. Dan Sayle came off his bike at Ballaspur and was taken by airmed to Nobles Hospital where his condition was described as serious but stable with a reported head injury.